Ron Paul’s book, The Revolution: A Manifesto, is the most refreshing exercise in political thought in a long, long time. Ron Paul, as you may recall, is the congressman from Texas who ran for the Republican nomination for president eventually won by John McCain. His message of liberty resonated with so many people that his campaign set records in campaign contributions and grassroots support. After McCain won the GOP nomination, Congressman Paul founded the Campaign for Liberty as a means of keeping the fight for limited government going. The ideology that so energized millions of Americans is summarized quite well in The Revolution: A Manifesto — and it’s all based on a single idea: rejecting false choices. From the very first sentence Paul shows how our political options are extremely limited by two parties that are strikingly similar — they are both advocates of a large, powerful centralized government. He then begins to tear down the false premises on which our political system is based. Paul demonstrates that both parties mutually agree upon the false premises from which these kinds of questions originate. No one in “mainstream” politics allows for the possibility that we shouldn’t wage preemptive war at all. They don’t accept that neighborhoods should make their own decisions apart from Federal mandates. And they reject the notion that citizens ought not have their income confiscated at all. “And so every four years we are treated to the same tired, predictable routine: two candidates with few disagreements on fundamentals pretend that they represent dramatically different philosophies of government,” Paul observes. This book sets out to expose and reject the false choices we’ve been led to believe are the only legitimate choices. Paul does this by first reintroducing us to the foreign policy of the Founding Fathers and to the Constitution. We learn that individual liberty was a foundational principle in America. We learn the government is only authorized to act with the consent of the citizenry. We learn that citizens’ rights are the result of an endowment from God and are not issued by the state. Yet, over the course of many years we’ve come to accept that we are somehow the property of the state — at least in part. We don’t object to the state claiming to be entitled to a portion of what we earn. We don’t object when governors, senators and presidents enact law and regulations against our interests without Constitutional authority. We don’t even object to the idea that the state has a “right” to force citizens into service against their will — a concept we used to call slavery. Ron Paul takes these lessons and applies them our economy, to civil liberties and to personal freedom. It is eye opening. We often lament that our country has fallen from the ideals intended by the Founding Fathers. Paul’s book demonstrates just how far. 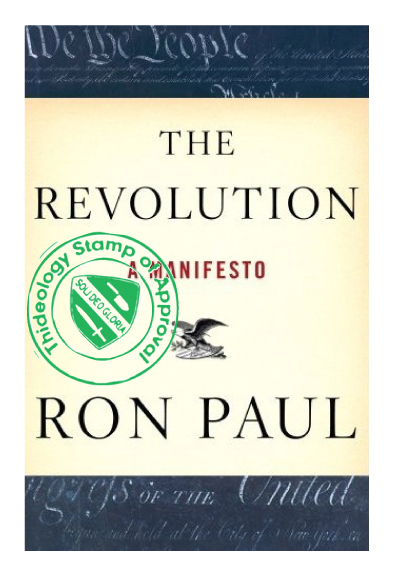 In his book Ron Paul makes a new plea for the minds of the people. Don’t continue to think you are making a difference when you accept the false choices presented to you from Washington. It is an illusion. Reject the false premises. Ask the right questions. Demand liberty. Ron Paul shows a new revolution is possible — one American at a time.